Does it come with anchors or wall fixings? Water heaters come with anchors for correct fixing to the wall. A tripod for vertical installation and belts, fixings for horizontal installation in the roof or below the floor, come as accessories. What litre capacity of boiler should I install in my house? the number of people living in the house. the amount of litres I am going to need at a specific moment. the space I have available for installing the water heater. The capacity of the tank, where the hot water is stored, will determine the quantity of litres of hot water we can have at a specific moment. The table below is only a guide, but it will help you determine what boiler capacity best meets the needs of your home. Can it be installed both horizontally and vertically? In the ACTIVE Water Heaters range by Gabarrón, only the MULTIFIX line is versatile for both vertical and horizontal installation. You just have to take into account that for horizontal installation the sockets are always on the left. The ACTIVE SLIM line can only be installed vertically. Is installation of a thermostatic valve with the water heater compulsory? Installation of a thermostatic valve next to the water heater is not compulsory but it is recommended. This can be obtained independently as an accessory. How do you calculate the installed capacity required? To calculate the capacity of thermal electric radiators we need to take into account various factors such as the area or location of the property and the type of insulation in the house. To get the rated output you mult multiply the calculation coefficient (selected from the table by area and insulation) by the square metres of surface area of the residence by its height. Room 12m2 and 2,30 metres in height in Soria for a dwelling with a medium insulation level. NB: it is recommended that you install the radiator or combination of radiators immediately above the calculation obtained. In bedrooms, kitchens and passages/hallways rated output can be reduced by 20%. If the home is situated on the top floor output should be increased by 20%. What are the advantages and disadvantages of Ecofluid versus Ecoseco? The main difference between a thermal radiator with fluid and a dry radiator lies in its interior. Ecofluid emitters hold special Premium oil with high thermal conductivity, which helps to transmit heat to the surface of the emitter. Dry emitters without fluid for their part create resistance in the form of a panel and that is what is tasked with transmitting the heat. Another difference is that the oil filled radiator will take more time to reach the set temperature compared with the dry emitter, which is quicker and more immediate. However, once the radiator is switched off, the fluid emitter will keep on transmitting heat longer through the temperature of the liquid interior in Ecofluid radiators, whilst in dry emitters, once switched off the emitter will cool more rapidly. The liquid is completely safe and non-flammable. 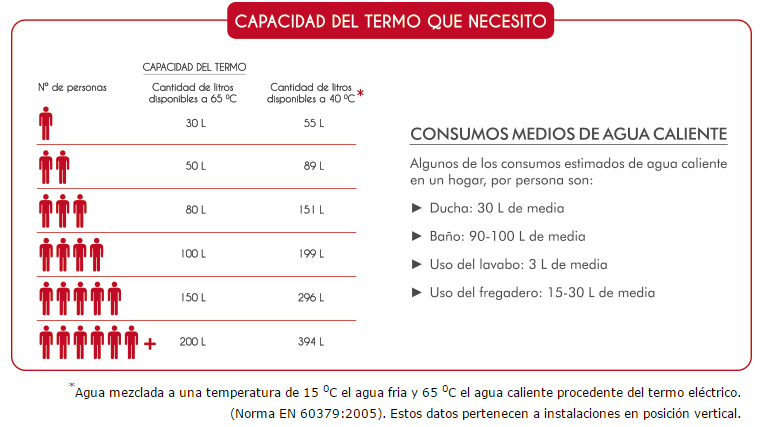 We guarantee the water-tightness of Gabarrón radiators for 10 years. Both types of radiators have the same consumption for the same output. Which type of radiator takes the longest to heat up? The main difference is that the oil filled radiator will take longer to reach the set temperature than the dry radiator, which is quicker and more immediate. Which type of radiator is more efficient, a radiators with Ecofluid or Ecoseco technology? Both types of radiators have the same 100% efficiency with the same output and the same electricity consumption. Is one safer than the other? They are both equally safe, as both types of radiator are built to the same safety standards and with the same electric heating appliance protection. Does one have a longer service life than the other? No, the radiators of both technologies have a similar service life. Do you sell radiators on casters, i.e. mobile? Casters are not included. They are sold as a separate accessory. Casters cannot be fitted to all ranges of Gabarrón radiators. Do you sell 2000W radiators and what is their availability? We do have 2000W radiators in stock but since this output is less common, we always recommend that you ask about their availability to avoid delays in delivery. Zero risk. Thermal fluid is not flammable. It is a liquid with a high conductivity that encourages heat transmission. In addition, units are built to safety and electromagnetic compatibility standards, meaning they can be turned on with total safety in any type of home including when the user is not at home, without any risk. I have broken the control/wheel on the radiator (temperature selector). How can I get a new one? Radiators with rotary or wheel controls/ temperature level selectors have an interior buffer or flange that may eventually separate owing to use or to excessive force. If this occurs, you can contact us on 91.628.14.40 or by email elnur@elnur.es and we will tell you what steps to take to get one or more controls. Do radiators come with plugs? Most ranges of our emitters come with a plug. Do the 14 hour heating elements substituted for the earlier 8 hours have the same calorific value or on the other hand is heat output less through lower consumption, even though the charge lasts more hours? The STORAGE HEATERS had stronger heating elements because previously the night tariff was only for 8 hours. When the night tariff went from 8 hours to 14 hours it was possible to install almost half the power in the STORAGE HEATERS. Consumption will be similar, because although the power is reduced to half, they will take almost twice as long to charge. SHowever, one of the advantages of fitting STORAGE HEATERS with a 14 hour charge is that, in many cases, the client can adjust the contracted demand charge and pay less per year for it. The big advantage of these units is being able to enjoy 24 hour comfort at a very reasonable cost. What is the equivalence of the 8 hour heating elements to the 14 hour ones? It depends on the line of STORAGE HEATERS. Each range has its own conversion between heating elements for 8 hours of charge and heating elements for 14 hours. How can I change 8 hour heating elements for 14 hour ones? If you have 8 hour STORAGE HEATERS and want to convert them into 14 hour storage heaters, all you have to do is tell us the storage heater model, i.e. the unit reference, and we will supply you with the right heating elements. How do I calculate the power I need to heat a room with a storage heater? To calculate the output of storage heater we have to take various factors into account, such as the area or location of the property and the type of insulation in the home. Room 12m2 and 2,30 metros metres high, in Soria for a home with medium insulation. NB: it is recommended that you install the storage heater or combination of storage heaters immediately above the calculation obtained. 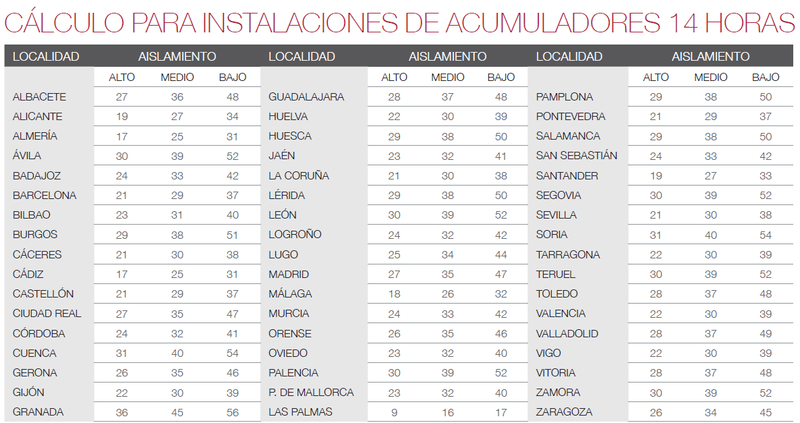 The table below shows the ratios by province and by type of insulation of a home, to make the calculations for installing STORAGE HEATERS, excluding the Ecombi line, which has its own table. The values in the table above correspond to the total capacity in W/m3 for installations with 14-hour charge STORAGE HEATERS. To obtain the rated output, you need to multiply the total capacity by the square metres of surface area of the home and by its height in metres. In bedrooms, kitchens and passages/hallways rated output can be reduced by 20%. If the home is situated on the top floor output should be increased by 20%. How do I calculate the power I need to heat a home with an ECOMBI storage heater? To calculate the power for Ecombi STORAGE HEATERS we need to take various factors into account such as the area or location of the property and the type of insulation in the home. To obtain the rated output, you need to multiply the calculation coefficient (selected from the table by area and insulation) by the square metres of surface area of the home and by its height. Room 12m2 and 2,30 metres in height, in Segovia, for a home with medium insulation. 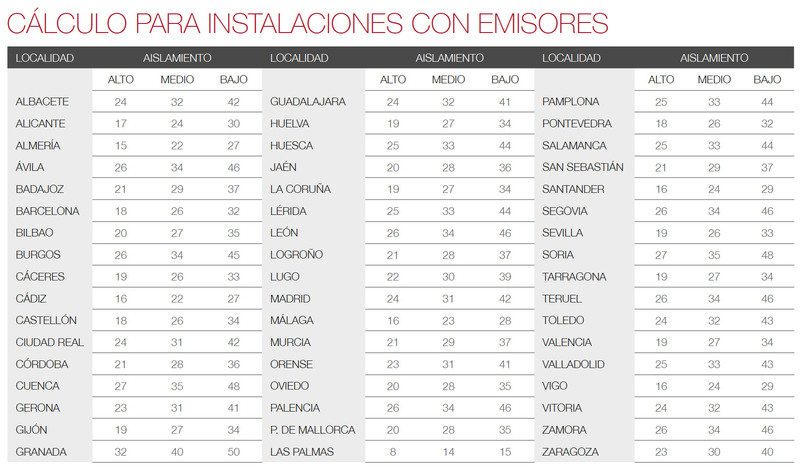 The table below shows the ratios by province and by type of insulation of a home, to make the calculations for installing of ECOMBI STORAGE HEATERS only. 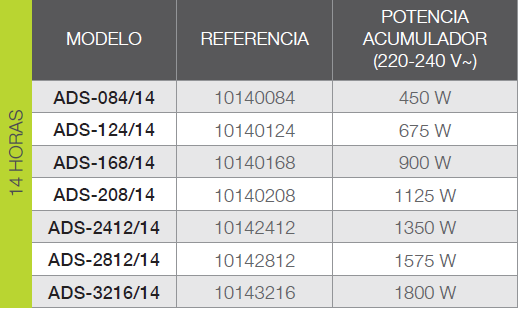 The values in the table above correspond to the total capacity in W/m3 for systems with the ECOMBI System. To obtain the rated output you need to multiply the total capacity by the square metres of surface area of the home and by its height in metres. Once the result is obtained, the ECOMBI System will be installed with storage heater power immediately above the rated output obtained. What is the Dual Sensor thermostat? It is a double bulb thermostat that takes the interior temperature of the storage heater core on the one hand and on the other, the ambient temperature of the room. If the temperature overshoots within the charge period, the thermostat will be able to interrupt the charge for a specific time and continue charging later. This avoids overcharging which can cause too much heat in the room and saves on electricity consumption, including during the off-peak period. Why doesn’t the storage heater hatch open? Whenever the storage heater is charging at off-peak periods, the storage heater hatch will remain closed and it will not be possible to open it. Nor can it usually be opened in the period just afterwards, owing to the great heat it accumulates inside. The bimetallic strip that operates opening or closing of the hatch is activated by the heat and so, if it detects very intense heat in the hatch, it will close it automatically. Does the Microtherm on the storage heaters have asbestos in it? Absolutely not.Since 2005, the European Union has prohibited the use of asbestos in any type of product. In the great majority of occasions where the upper area of the wall appears darker it is because of airborne dust that is burnt on starting up the unit causing this soiling next to the unit. Smell from radiators and storage heaters. Both radiators and storage heaters are heating units that only work during a few months of the year. The rest of the time, outside the heating period, these units are switched off and with the passage of time, they tend to collect a certain amount of dust on the surface or other areas or on the vents of the units. When after several months of not being used we switch the units on again, we may notice some smell owing to the surface dust burning in the heating elements of electric radiators without thermal fluid, or dust collected in the vents of storage heaters. Which storage heater is better, a dynamic one or an Ecombi? The current dynamic storage heaters have greater power and are intended to cover more square metres, i.e. living rooms or large houses. Dynamic storage heaters require a thermostat to work, and the thermostat will have to be one that operates the fan incorporated in dynamic storage heaters to heat the home rapidly not only by transfer but by forced convection. Ecombi storage heaters are quieter than dynamic ones as they do not have a fan incorporated, which is why they are highly recommended for rooms. In addition, Ecombi storage heaters have the great advantage that they automatically self-regulate their charging every day, according to heat requirements and taking temperature changes into account, so they are capable of saving up to 15% over a dynamic storage heater and up to 35% in energy consumption compared with a manual storage heater. I have broken the charging/discharging control/wheel on the storage heater. How can I get a new one? You can contact us on 91.628.14.40 or via email elnur@elnur.es and we will tell you what steps to take to get the charge and/or discharge controls. The storage heater doesn’t heat like it used to or it is noticeably warmer in some areas. Most probably one of the unit’s heating elements has been damaged. This is a simple repair, which once fixed will allow the storage heater to function 100%. You need to contact one of our Authorised Service Providers to change the heating element. 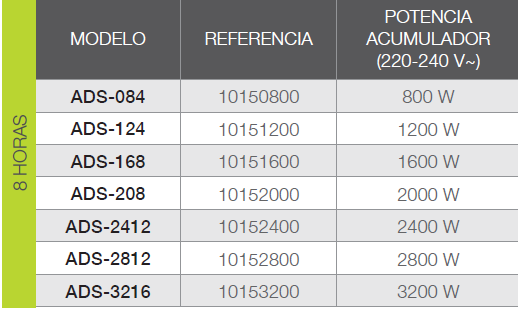 You can find the ASTS (After Sales Technical Service in Spain) list by province online at www.elnur.es .You can also contact us direct on 91.628.14.40 and we will give you the phone number for your nearest ASTS in Spain, or send us an email to elnur@elnur.es. Do the storage heaters have supports or casters to move them between rooms? No. The storage heaters are installed in a fixed position and must be correctly installed and fixed to the wall. Can I change an old storage heater from one dwelling to another? If the storage heater is old or at least more than 8/10 years old, we do not recommend that you uninstall it from one site to take it to another. After a few years of operation, some of the storage heater’s insulation, such as wool fibre or microtherm, can deteriorate if moved from their original location. This type of component can be acquired from “Spare Parts” via our Post-Sale Service Provider network or via our on-line store. Why are my STORAGE HEATERS not working after I’ve got a new meter? This mostly occurs with old storage heater systems, because along with the old meter you installed a clock that sent a signal via a pilot wire or red lead to the contactor in the electric control box in your home. This contactor is what allows energy to pass into the STORAGE HEATERS during the charging period (off-peak hours on the night tariff), letting a current pass during this period and afterwards to cut the passage of electricity to the units. The problem appears with the installation of the new digital meter, because they leave the pilot wire disconnected by eliminating the clock installed next to the old meter, so the contactor does not receive any signal for when energy should pass to the STORAGE HEATERS. Which type of boiler would suit me? – The first thing we have to decide is what type of boiler we are going to need according to the requirements we have to meet, i.e. if we are going to need just heating or if we are going to need a combi boiler that covers all our heating needs as well as those of domestic hot water DHW. The next thing to take into account is whether we are going to need a wall-mounted or floor-standing boiler. Finally we have to decide the capacity of the boiler we are going to need in the system. It will all depend on the home’s individual system. Monophase is where the electricity travels by a single flow of alternating current. This tends to be the more common system for apartment-type dwellings. Triphase is what is used for larger chalet-type properties or businesses, and consists of three flows of alternating current for the electricity to pass. The boiler should be adapted at the point of manufacture for the type of system in the dwelling where it will be installed. This system in combination with an ambient thermostat will adapt the heat output to the system’s heating needs, saving on unnecessary energy costs. What is Auto heating Regulation? This is another feature managed by the EMS System. It is possible to regulate the temperature at which the boiler boosts the heating circuit water, according to the existing temperature outside the dwelling. This method of regulation offers maximum comfort, because it anticipates changes in the heating needs of the house. An external temperature sensor needs to be connected to activate this mode. You can get more information on “Exterior Sensor” for temperature in our accessories section. Without an ambient thermostat, doesn’t the boiler work? Mattira boilers can operate perfectly without an ambient thermostat. Lack of a thermostat will restrict the boiler so it cannot modulate the Auto Heating Regulation function, nor can this be activated; both features that help not just to improve the dwelling’s comfort, but to avoid unnecessary consumption of electricity. You can find different models of ambient thermostats and chronothermostats in our accessories section. What does the boiler come with? Mattira boilers by Gabarrón come with everything they need for correct operation once installed. Unlike other brands, our boilers come with both the circulation pump and the expansion vessel. What are the differences between 18 kW and 15kW boilers? 18 kW boilers might require this output at most, in one system. The kilowatts will determine the maximum output both boiler models can reach. On the other hand, both models can be configured to reduce their output and limit the boiler to the maximum requirements of the system. The main difference between both is that the 18 kW model, because of the type of resistor it has inside, will be able to modulate in outputs of three in three stages, and it will be possible to limit the boiler’s outputs to 3kW, 6kW, 9kW, 12kW, 15kW and 18kW. By contrast, the 15kW boiler will be able to modulate in 1kW stages and it will be possible to limit the output from 3kW at least up to 15kW (excluding 14kW output). Can a service technician change a monophase boiler to triphase and vice versa? ASTS or After Sales Technical Service can carry out the necessary adaptations to convert a monophase boiler into triphase and vice versa. However, we recommend giving this information at the start of the order, so we can ensure that the boiler leaves the factory configured and adapted, as nearly as possible, to the system in which it is going to be placed. Can I substitute a gas or oil boiler for an electric boiler for supplying heating and domestic hot water? Absolutely. Electric boilers will use the same water circuit to heat the house as gas or oil boilers. They are a perfect solution for every type of dwelling, whether renovated or new build, and for those without access to the gas network supply, or with other kinds of limitation. In addition, they do not use combustible fuels and can be installed in unventilated rooms, thus avoiding annoying ventilation grilles which compromise the dwelling’s thermal insulation. Can an electric boiler be installed to supply hot water with fancoils? Yes; the boiler will be responsible for heating the water in the hydraulic circuit to which the fancoils will be connected. These units act as a means of transferring ambient heat. Can Gabarrón electric boilers be used for underfloor heating? Yes; Gabarrón boilers are perfectly compatible with an underfloor heating system for heat transfer as a central heating system or hydraulic circuit. The factory will just have to be informed for adaptation of the heating thermostat for this purpose. Can the system be compartmentalised with underfloor heating if various independent circuits are installed? Yes, it can. Gabarrón electric boilers will be able to operate to give you heating via underfloor heating, even when the circuit is installed in various hydraulic circuits to compartmentalise the system. If the circuits are underfloor heating circuits, you will be able to install the boiler directly, but always leaving 1 circuit in operation through which 7l./min. pass, to avoid Error3 (water circulation error). If the circuits work at different temperatures, for example one with underfloor heating and another with radiators or fan coils, we always recommend installation of a buffer tank connected to the boiler. In this case, the tank will be heated by the boiler to the higher temperature needed by one of the circuits (for the radiators) and the lower temperature circuit (for underfloor heating) will have to have a mixing valve fitted in the outlet from the buffer tank leading to this circuit. Water leak or drip in the boiler. What maintenance do electric boilers need? Electric boilers do not require any sort of compulsory maintenance. We, as the manufacturer, recommend that the boiler’s power cables, electricity consumption and pressures be checked. What heating should I install? What factors should I take into account when choosing heating? The insulation grade of the building or dwelling. When making our calculations we must take into account the house’s insulation grade: if it has been renovated and if there has been investment in improving the insulation, the year of construction etc. Climatic conditions in the area. Province and location are essential in determining if we are talking about a warm or cold area. Any system already in place for heating and domestic water. If the dwelling already has a hydraulic circuit installed with water radiators or underfloor heating or if, on the contrary, it has no circuit and what we are looking to do is install individual electric heating for each room. The heating requirements of the user or those living in the house. It is not the same thing if 24 hours a day heating or just 5 or 6 hours of heating is required. Just as it is very different if there are always people at home, children or older people, than if we are talking about a house where people are only there from eight at night or where they only go at weekends. The contracted electricity tariff and the contracted demand charge. In general, at Elnur we always recommend arranging an electricity tariff with time discrimination, i.e. the former night tariff. This tariff, in the current regulated Spanish market, is called PVPC [Voluntary Price for the Small Consumer] with time discrimination called 2.0 DHA, although you may also come across other similar ones on the free market from any electricity company. With this tariff, there tend to be more savings on the bill, because of off-peak hours, the cheapest being 14 hours a day. The demand charge will be linked to the type of heating, because it will be necessary to contract for as many kW of heating as we are going to need, in addition to the usual domestic consumption: fridge, TVs, washing machine, tumble dryer, ceramic hobs, microwaves, lights, etc. Do you sell the product direct to individuals? Where can I buy spares parts? Most of spares parts can be acquired via our ASPs (Authorised Service Providers), or higher turnaround spares from our on-line store. How can I find my nearest After Sales Technical Service (ASTS)? On our website you will find a complete list of After Sales Technical Service in Spain for Heating, Air Conditioning and Heat pumps air to water products. Sales Technical Service. The product warranty will depend on the type of product, as well as the component concerned. The standard warranty is for 2 years, as indicated by law. However there are components where we extend the warranty period to 3, 5 or 10 years. I can’t find the warranty document. If the warranty document or purchase receipt cannot be found, please contact us on 91.628.14.40 or via email elnur@elnur.es, telling us the model and barcode of the product. With this information we will be able to track the product to determine the date of purchase and establish the warranty period. This information can be found in a sticker on the unit. Depending on the product, this sticker may be inside the front, on a side or at the back. How can I take advantage of cheaper night-time electric tariffs? During the OFF-PEAK period, kWh is up to approximately 56% cheaper than the standard tariff, benefiting from this reduction 14 hours a day. kWh in the PEAK period is only around 20% dearer than the standard tariff. This is the regulated tariff, which does NOT apply to the free market but which can be taken out with the main electric companies in Spain. Which are the main reference distributors for the regulated Spanish market? The reference distributors are energy companies designated by the Ministry for Industry as companies that are economically and structurally qualified to offer tariffs regulated by the Government. Only a limited number of these can provide this type of tariff to end consumers. What should I take into account when taking out an electricity tariff or changing companies? According to the CNMC [National Commission on Financial Markets and Competition], before contracting the consumer must be made clearly aware of any electricity offer, its terms and conditions and, in particular, the obligation to remain in the contract, the obligation to take out other additional services, the updating of the terms of the offer, and cost-free services in addition to the supply offered. Paying special attention to these points can avoid later unexpected surprises. What tariffs can the reference distributors offer? The price of light per hour: a contract system where a different electricity cost is paid every hour of the day according to the offer and the lighting demand in the wholesale market (pool). Only a user with a digital meter can qualify for the price of light per hour, as consumption has to be metered in each time band and this enable the supplier to apply the price corresponding to each instance of consumption in the dwelling. The weighted average price: sonly applicable with analog meters. Distributors have until December 2018 to change all metering equipment to new digital units. The annual fixed tariff which sets an electricity price lasting for 12 months where no price increases or reductions are allowed. This tariff must be requested beforehand by the user. The reference distributors are the only ones who can apply the social benefit [discount] to the most vulnerable groups, those the government says are entitled to benefit from this assistance. Is there any way to check if my lighting bill is correct? consumers with a contracted supply of more than 10 kW, even if they are supplied by a reference distributor.